You don't tend to see a lot of barley wines/barleywines around (which is perhaps why you find brewers spelling it as both one and two words). It's understandable given their size, the cost of such boozy beers under Australia's tax system and their limited appeal in a country that, for the most part, is still waking up to hoppy pale ales. 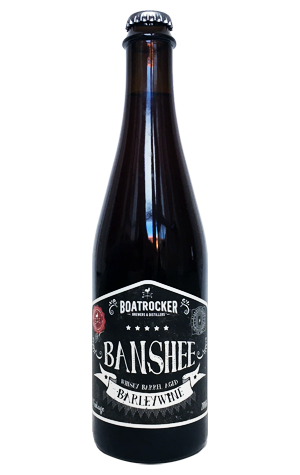 Yet winter 2018 has seen a veritable smorgasbord leave local breweries, including the latest iteration from Boatrocker. It's another of the Braeside brewer's beers to take advantage of the flourishing brewmance with Starward Whisky, and it leaves you in little doubt they've been working together again, with plenty of the distiller's juicy young whisky shining through, particularly to taste. Yet, as we've come to expect from Boatrocker, it's not at the expense of the other elements in the beer, just one part of a luscious, all-enveloping doona of a beer. It's one the label tells you is ripe for ageing, but it's ripe for the picking now too, with layers of sweet, fortified wine and dense dessert like malts just waiting to tuck you in for the night.